Simplify your Office management with TouchPoint Office Management Software. 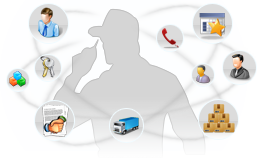 Efficiently manage your courier, keys, vehicles and calls. Save cost through optimal resource utilisation and increased employee productivity. TouchPoint Office Administration software effectively takes care of all the support functions of your office, right at your desk! Tracking employee movement unlike materials is a very sensitive issue. Maintaining a comprehensive tracking mechanism is nevertheless vital and what better way to do it, than automate the entire process. The Employee Register in TouchPoint is a handy tool to monitor employees' time in and time out and to maintain a listing of all employees who have worked on holidays too. The Vehicle Management module tracks movement of vehicles owned by the business. Proper controls can be maintained as the movement of each and every vehicle will now be monitored meticulously. Necessary alarms can be raised when a vehicle has not checked in after the expected time in. TouchPoint is being used for day to day activities of couriers such as capturing the courier No., sent/received date, sender/receiver, picked date and many other things. The Key Register maintains a track on the movement of keys between employees / departments within the organization. What happens when calls are not recorded in properly and not intimated to the concerned executive? Can you afford to miss business calls and not return them? The Call register is the perfect solution to recording all unattended calls especially during non business hours. Now days it is hard for a corporate to retain the business for several years without an adequate customer support service. Considering the fact, Helpdesk best suits for any good business strategy that can help the company. Helpdesk module is a reliable and responsive client support center.